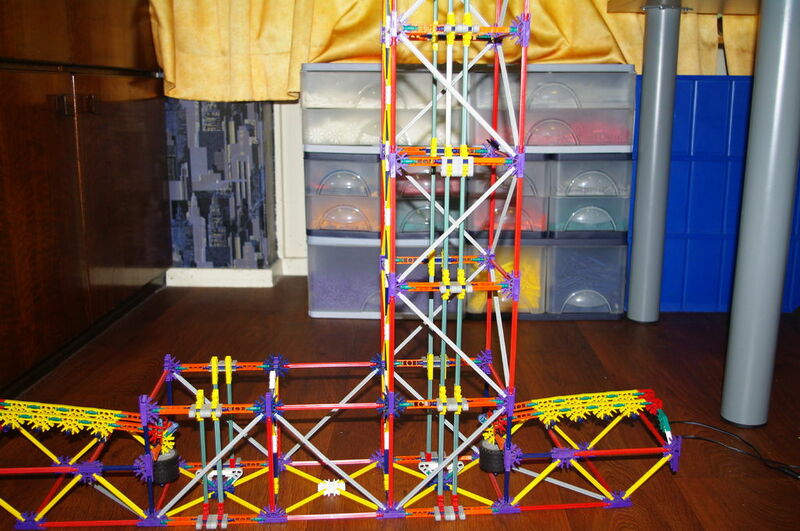 Hello everyone, I'm pleased to present you my newest K'nex ball lift. Hope you enjoy. If you want to build the lift higher repeat this part. Difficult part. Hopefully the pictures are clear enough. The video above is the lift in my ball machine Interwined. Thanks for building or watching. If Leonardo Da Vinci were alive today, he would be humbled by this design. This is a beautiful design. I was up until 7:00 this morning building on this thing and am very eager to get it done.. Great work..
Wow! Thank you very much! Nice to hear you have build the lift! If you send me a picture I will ad it. you asked for it.. I had problems making the counterweight work. I think my problem is that I used the wrong sized rubber band. I found the same kind of band that you used on yours and haven't put it on yet.. Thank you for the picture. I hope it works now! That is awesome! Can't wait for it! Thank you! omg, i just finally realised how it works. The gear don't change direction the chain move height. stupid me. Iv'e been stuck on it for weeks. Aww that is sooo cool! I've always tried to make something like this! It cost me weeks.. :o But it's done and it works wel, thank you! Definitely the fastest-moving and most piece efficient elevator lift I have seen yet. Great job! Wow! That's awesome! Do the lift work? Great lift! I like how the gears change direction.